InsuranceCompany.com offers dental insurance quotes for individual and family dental insurance plans for all 50 states including an option to compare national coverage. Please enter your zip code and press enter to view a list of free dental insurance quotes or to find a dentist. The dental insurance programs listed are based upon the zip code you entered and their availability. If we are unable to offer dental insurance, we will provide a alternative dental plan, if available, and clearly state it. Please be sure to contact the dental office to confirm they are accepting new patients and the dental plan you have selected. 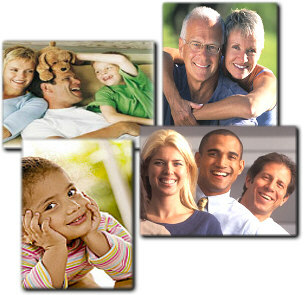 Many of our dental insurance plans have next day benefits including vision and prescription. Remember, buying dental insurance does not have to be a painful process. Finding the right value in individual dental insurance and family dental insurance is an important step in purchasing affordable dental insurance health care coverage. Both types of dental plans (dental insurance and discount dental plans) have advantages and disadvantages and one size does not fit everyone. Keeping this in mind is an important rule when you shop for the dental plan that best fits your needs.